It is an important step for kids to be able to recognize and differentiate between various visual images. 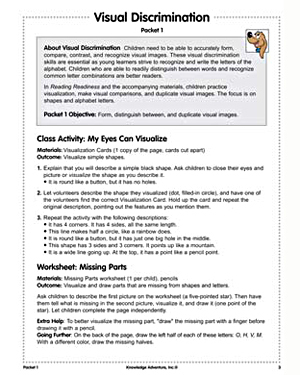 As the name suggests, ‘Visual Discrimination’ is a lesson plan with critical thinking activities and worksheets that give the little ones the opportunity to practice discriminating between images and compare, identify, and fill in missing parts. Teachers can use ‘Visual Discrimination’ as an exciting classroom activity to make learning more fun for kids! Free lesson plans like these are a valuable resource for teachers, making it simpler to teach kids new concepts with ease.